Belvedere Designs: Looking for a Giveaway? You'll want to check out Kathryn's review at MommyKatandKids. She's done a great job of describing the wall quote appliation process step by step (for more info and our own photo tutorial, click here). 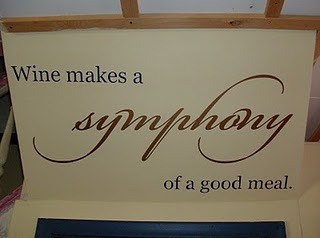 Besides, the wall quote she received ('Wine makes a symphony of a good meal' in the Kitchen Wall Quotes collection) fits perfectly in her wine-friendly home - she even makes her own wine!